What’s Next For The Market After 5 Up Days In A Row. The market is now up five days in a row since Carl Icahn’s “looming catastrophe” video. We explained the importance of that video here Danger Ahead. If you remember, at the time the Russell 2000 was down eight days in a row, the Nasdaq composite was down six days in a row, and the entire world was betting on a break of the August 24 lows. The things is; that the market goes up and down not up or down. After seeing all the negativity on my twitter stream, I decided to tweet some of the things that can go right after eight straight down days. One day and a decent bounce later, the majority again was quick to dismiss the bounce as one that was going to fail immediately, especially after hearing a dire warning from a billionaire. Fast forward five days and sentiment now seem to be leaning in the “we are never going down again”, which is a possibility that is practically impossible. This market continues to remind of 2011. 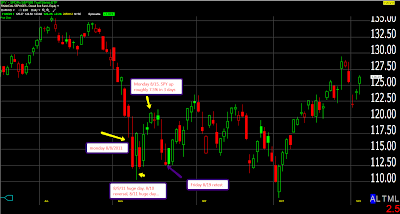 We had multiple rallies that were faded and various selling routs that were faded as well. I think we should treat the current market as such until the middle of October. Since 2000, we had 12 instances in which we were up five days in a row, with 5%+ gains. 12/12 closed lower at least once in the next five days, at an average of 150 basis points at the first negative close.–PastStat. Choose your entries and exits wisely in this volatile market.